Available August 16th, the Mary Kay Gel Semi-Matte Lipsticks will retail for $21. There will be 8 shades in the line. "Gel semi-matte lipstick is the first full-coverage lipstick by Mary Kay to utilize gel microsphere technology for rich, stay-true colour that lasts for hours — without leaving lips looking or feeling dry." The texture on the Mary Kay Gel Semi Matte Lipsticks feels creamy and comfortable. They do not leave your lips feeling dry or cracked. They contain Jojoba esters and Sunflower oil which will help to condition your lips. As for the amount of shine, semi matte is true, similar to classic cream formula but with a little less shine. The packaging is sleek and a shiny black color with a silver decal. 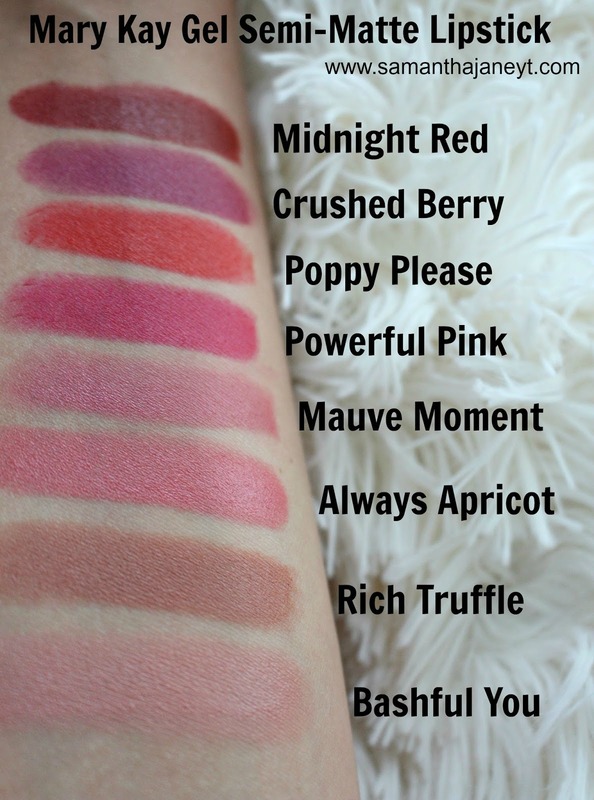 The shade names are indicated on the bottom with a sticker but there is also a clear top on the lipstick tube itself that allows you to see which shade you have, this is especially helpful if you have multiple! Shown below. The texture on the Mary Kay Gel Semi Matte Lipsticks feels creamy and comfortable. They do not leave your lips feeling dry or cracked. I did not find these slipped around on my lips, a lip liner will help if you have issues with that. When I wore Always Apricot it did leave a little bit of a light ring of built up product on my mouth. Powerful Pink lasted on my lips for 3 hours until I ate a burger, however it did not end up all over my face! The pigmentation is great, one or two swipes to opaque. They do not look patchy or drag upon application like some matte lipsticks can. I think they shade range as well has all of the classic shades you look for in a line. Overall, I really like these a lot! The shade range is perfection, so many beautiful staples! Which one is your favourite? *These products were sent from PR for my consideration.